Suretrack Dual Wheel System: Smooth and fluid gliding track system allows your machine to roll back and forth on a track. 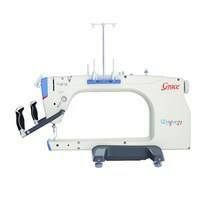 This enhances stitch quality, efficiency, accuracy, and carriage motion. Channel Locks: Easily lock your machine direction into either a back and forth motion, or side to side motion. This conveniently located locking system and superior clamps allow you to secure your quilt to the frame as you sew. No-Baste Style Frame: The no-baste design completely eliminates the need for basting and makes your quilting projects easier, more convenient, and more beautiful. Save hours of time and finger strain by simply rolling your quilt onto the rails, and using the attached leaders for guides. Each layer is on its own rail and come together onto the take-up rail as you go. The locking ratchet ends provide precise control over the tension of the fabric layers. Leveling Feet: These leveling feet are a simple way to make sure your frame is level and balanced no matter what type of floor you are on. Adjustable Depth: Modify the depth of your work area to match your frame. Expand your work area for larger patterns and quilts with long-arm machines or get closer when working with short-arm machines. Height-Adjustable Legs: These height adjustable legs allow you to work at a level that is most convenient and comfortable for you. Hand-Wheel: Roll all of the layers of your quilt with the take-up rail hand-wheel. This wheel moves your fabric to the next area of your project which makes quilting simple and effortless. Steel and Cast-Alloy Components: The steel and cast-alloy components of this machine ensure that this frame is one of the most sturdy and long-lasting frames ever designed. 8 Foot Frame: 79 inches. 10 Foot Frame: 103 inches. 12 Foot Frame: 127 inches. Batting Rail: Keep your batting neat and off the floor by using the convenient batting rail. This fourth rail is a perfect way to organize and hold your batting layer. Idler Rail: Are you tired of constantly stopping to adjust your take-up rail as you quilt? This idler rail eliminates the need to do so by allowing the fabric to collect on the take-up rail at a higher location. 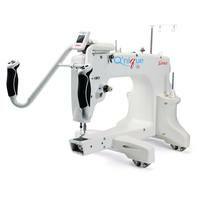 This accessory only works with longarm or midarm machine that have a large throat space. 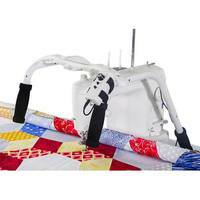 Moving Rail: Expand your quilting reach with the moving rail kit. This kit gives you up to 4-6 inches more reach and keeps block size consistent. Normally, layers collect on your take-up rail which takes up space and reduces your reach. 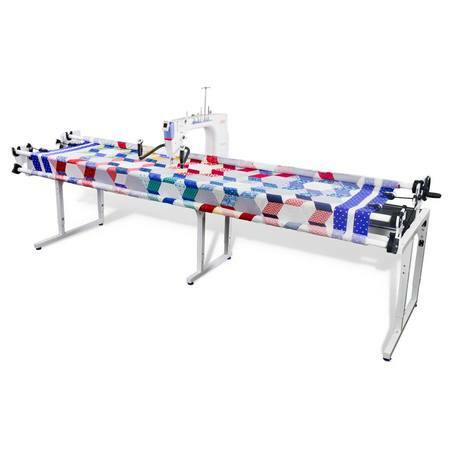 With the moving rail your reach stays the same throughout the entire quilting process by putting all the fabric build-up onto this one rail and out of your way. Limited 1 Year Manufacturer's Warranty.